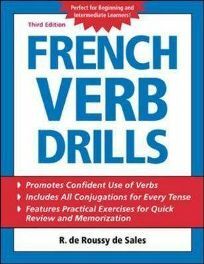 If you are looking for a workbook for verbs, French Verb Drills by R. de Roussy de Sales would be an excellent choice. The book is divided into two main sections, Part 1 being on regular verbs and part 2 on irregular verbs. Part 1 has twenty-seven subsections dealing with the various tenses and moods; several of them are devoted to regular -er verbs that have idiosyncratic changes in spelling such as ‘Verbs ending in -yer that change -y- into -i-‘. It does make for clarity when such subtleties are singled out and given a page or half a page to themselves. Etre and avoir are in actual fact included in Part 1 although they are irregular verbs; this is presumably because they need to be learned in order to form compound tenses (such as the passe compose or perfect tense) of regular verbs. Part 2 is divided into thirteen subsections that each deal with two or three irregular verbs that have something in common. Poor old s’asseoir (to sit down), however, stands alone in section 40 – there is no other verb like it, thank goodness, with its present tense je m’assieds and future je m’assierai. I read once that even French people have difficulty conjugating it. Some of these sections in Part 2 give lists of other irregular verbs that are conjugated in a similar way; for example, in Section 29, covering dormir (to sleep), prendre (to take) and ouvrir (to open), there are lists of four or five verbs that follow a similar pattern to each of these. Section 31 includes one of the most common irregular verbs, faire (to do or to make), and gives almost a page and a half on idiomatic uses of this verb in a very clear list that is almost certainly easier to read than a dictionary entry. Each of the forty sections of the book gives verb tables, and there are brief explanatory notes where necessary. Usage of the various tenses and information on the negative form are covered in Part I. Interspersed are a hundred and one practice exercises in total, some of which require translation whilst others involve giving the correct form of particular verbs. One or two of the exercises give quotations by French writers, which is quite an unusual feature of workbooks today and gives the work a certain appeal. The book ends with an answer key and a French-English then finally an English-French Index of Verbs. The front cover of the book states that it is ‘Perfect for Beginning and Intermediate Learners’, although a complete beginner would need to take this a little at a time, probably using it alongside a coursebook that is taking a communicative approach, to give extra practice. I have used it with students at AS Level who were struggling to get to grips with the subjunctive mood and the passive voice, as well as with intermediate adult students. Parts of the book would be useful for GCSE students. The layout is very clear and not overcrowded, making it easy to follow – it is a much larger format than most reference verb table books that are intended to be carried around (such as Bescherelle). I would certainly recommend French Verb Drills, particularly as many language coursebooks do not give sufficient practice in verbs. Some students may prefer comprehensive grammar workbooks such as Schaum’s Outlines, but verbs are usually the area where most language learners need to focus the most, so this is sure to be a particularly useful workbook for the majority. No Comments on "French Verb Drills"